There is divine beauty in learning…. To learn means to accept the postulate that life did not begin at my birth. Others have been here before me, and I walk in their footsteps. Jo-Ann Cerdenia started learning the concert Harp under the tutelage of Lourdes de Leon-Gregorio, the forerunner of the harp playing in the Philippines. After finishing her studies in composition at the UP College of Music, she moved to Germany and studied harp with Fabiana Trani and pedagogy with Wolfgang Rüdiger at the Robert Schumann Hochschule in Düsseldorf. While finishing her studies there, she had the opportunity to attend Master Classes with world-renowned harpists Alice Giles, Irina Zing and Olga Shevelevich. She also received harp methodology instruction from harpists Hye-Young Kim and Susana Feige. While being a music student, Jo-Ann Cerdenia has always been a very passionate and dedicated music teacher. She and her pupils work very hard and culminate their efforts in regular recitals called Joys of Music (Philippines) and Freude an der Musik (Germany). 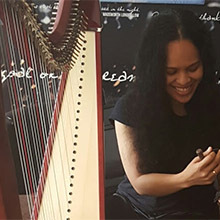 Jo-Ann Cerdenia aims to spread the passion for harp playing in the Philippines by developing harp teachers and bringing up young harpists that could continue the legacy of her very first harp teacher - Lourdes de Leon Gregorio. She also works hard to inspire and encourage young people from poor families and difficult circumstances to dream big and work for it. Being one from a very humble background, she believes that with guidance, diligence and determination, anyone could be a great harpist. Make harp music a part of your life. Get in touch with us and take your first steps!